We offer a full range of services, from lens design to complete lens production including our legendary lens edging program. Available to you is also our full prescription Rx Lab, lens edging for sunglass frames and plano lens edging services. 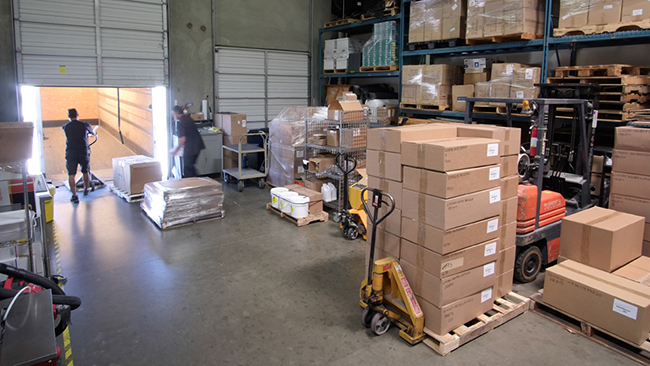 Our cost effective product warehousing solutions, order fulfillment and kitting services will help you save money in the long run. Sunglass plano lenses can be edged with remarkable precision using our state-of-the-art MEI Lens Edging equipment. Our facility delivers high volume production using three MEI Lens Edging machines capable of edging 4,000 pairs per day or more. 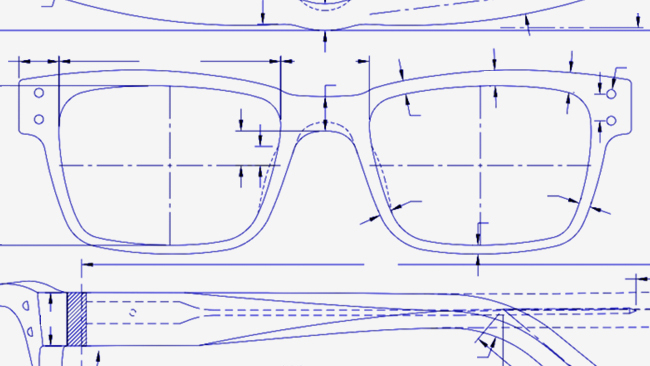 We use 3D drawings, DXF files and other formats to provide edged lenses of the highest quality. Our well-trained team of specialists is ready to take on your jobs. Please contact our sales department for an estimate. 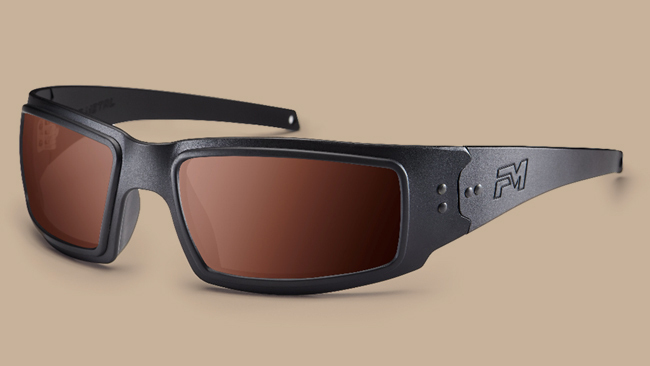 AmSun offers full sunglass assembly – from inserting a fresh-cut edged lens into a frame, to attaching hinge screws and rivets. High volume lens mounting can be done for plastic zyle, metal, groove, three piece mount and 8 base wrap sports frames. Please let us know what you need to complete your unique sunglass product. Metal frame private label is also available. 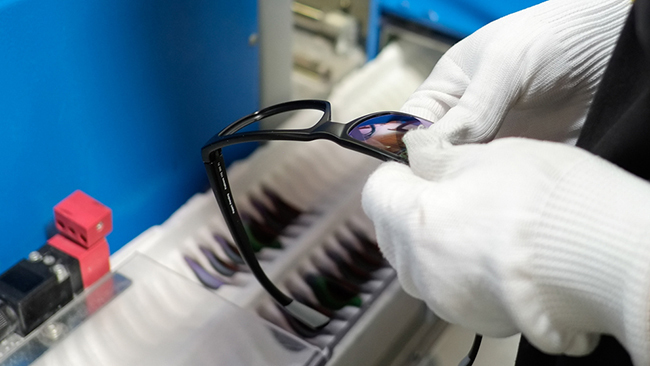 Frames are made and assembled in the US with top quality materials. 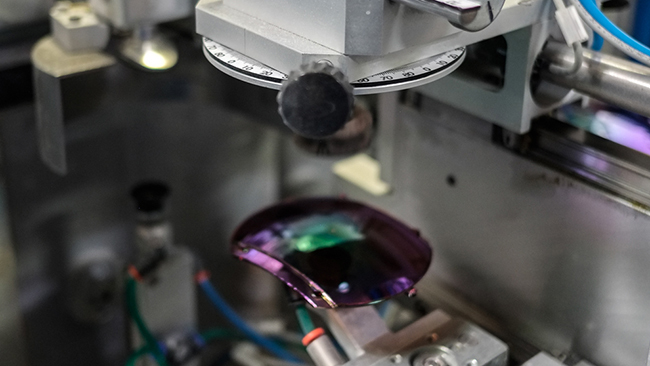 Lens options include made in the USA, safety lenses, special light filters, tinted or polarized for sun lenses, all cut and assembled at our state of the art manufacturing facility. Contact us for minimum order quantity and pricing. Through our in-house full Rx Lab we offer an integrated Digital Free Form Processing System which allows us to manufacture high based lenses on sports frames. 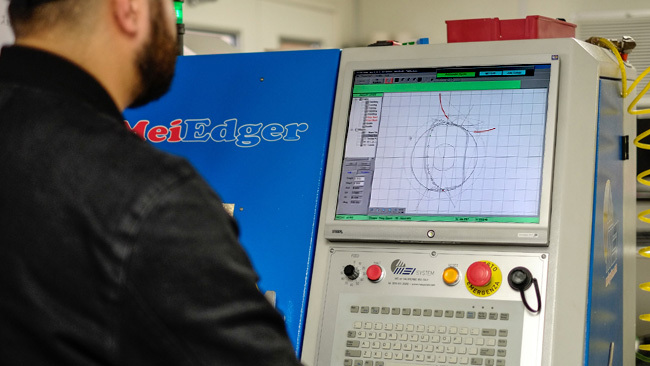 We can cut on our MEI 641 edger, lenses for high wrap frames that require hooks, vents, notches, step / shelf bevels and any other complicated shapes. 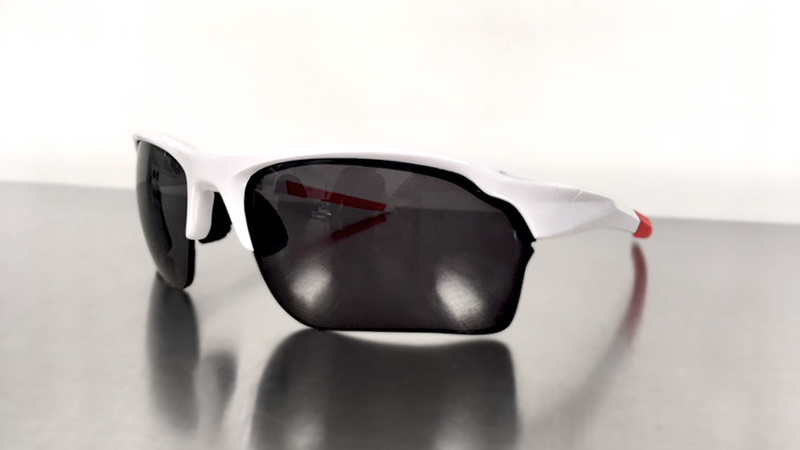 We also offer mirror coatings and matching tints to complement your sun lens frame line. We have tailored solutions where we morph our operations around your systems and needs rather than you conforming to our process. 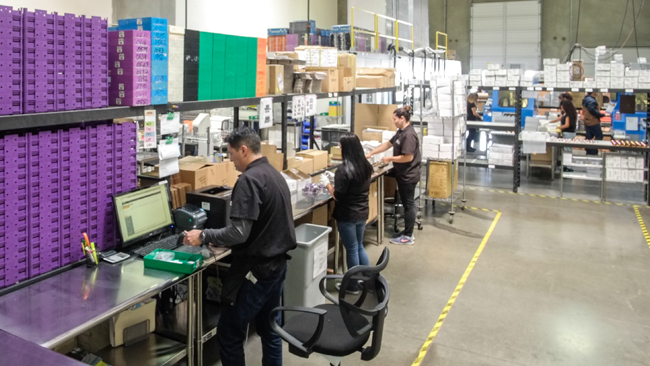 Kitting, assembly and packaging services incluiding pick and pack and order fulfillment / eFulfillment are a few of our additional available services. Our full kitting service includes expert presentation and rapid turnaround of standard, rush and custom orders. We are equipped to receive frames from any supplier worldwide – Italy, China, Japan or wherever your sunglass product may be produced – and complete the job with our best quality edging. 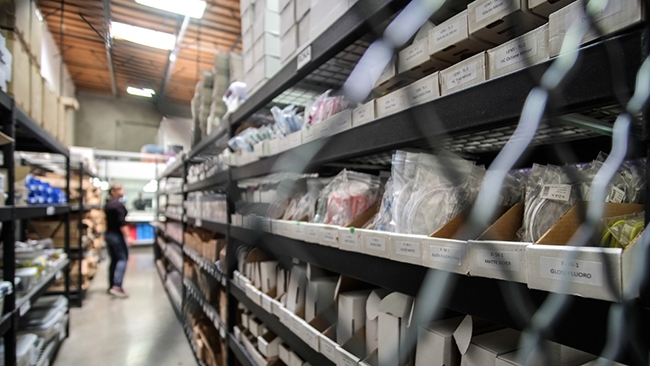 We will securely store your eyewear components onsite; edge, mount (glaze), clean and inspect each order; and professionally package completed jobs with your personal touch. Orders are shipped direct to your warehouse or final consumer. We offer our clients strategy, planning and problem solving and assist with organisation. Our engineers expertise can provide advice and guidance from the initial stages of design trough mold manufacturing and production planning. Engineering consultation can include design, supervision, execution, repair, maitenance, creation of drawings and specifications, and make recommendations to our clients.